There are many options available to building owners faced with choosing a new roof. From material selection to system specifications, it is essential to find the right roofing system to meet the buildings longevity, durability, and aesthetic needs. Two options available to building owners for both new construction and retrofits are r-panel roofing and standing seam roofing. R-panel is a generic roofing industry term used to refer to a metal panel that is commonly utilized in the pre-engineered metal building industry. R-panel sheets are 3’ wide with major ribs 12’ on center and panels are installed with fasteners that penetrate the panel and attached to the substrate or structural members below. This style of panel is typically used for walls and roofs on pre-engineered metal buildings. 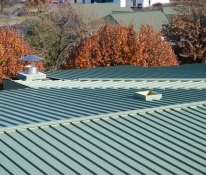 It can also be used for residential roofing, although this is primarily seen only in Texas. Standing seam metal roofs are typically installed vertically and run from eave to ridge. Standing seam systems feature a raised interlocking seam that connects adjoining panels together. This type of roofing is used in commercial, residential, and industrial settings. Standing seam systems are installed with hidden clips and fasteners, eliminating visible fasteners which are more prone to leaking. You can learn more about standing seam roofing here. 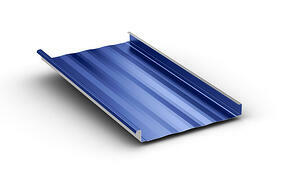 The primary advantage of r-panel is that it is widely available and economical. Additionally, because r-panel is installed with exposed fasteners, it is faster to install. For most applications, however, the increased cost and install time of standing seam roofing is an acceptable trade-off for the many benefits of standing seam panels. Standing seam panels offer building owners significant advantages in terms of appearance, durability, and lifespan. With no unsightly exposed fasteners and a large selection of style and design options, standing seam systems are more aesthetically pleasing and visually versatile. Concealed fasteners are also less prone to leakage making them the more durable choice. Perhaps the most important advantage from a practical standpoint is its lifespan. Compared to r-panel roofing standing seam has a much longer lifespan. A part of its longer lifespan comes directly from the use of concealed fasteners because exposed fasteners penetrate the surface of the roof while concealed do not. 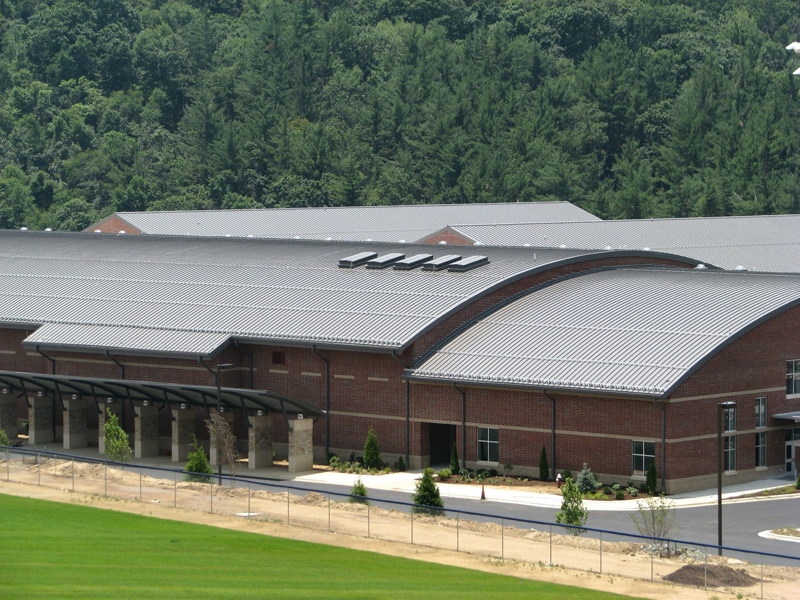 Our Maxima roofing system is an excellent example of a standing seam system. Maxima offers a wide variety of options including 1.5, 2, and 3” seam heights. Two of its three profiles (the 1.5 and ADV) can be curved as well. This particular standing seam system also features excellent strength and wind uplift characteristics because its panels are mechanically seamed. You can learn more about Maxima roofing here. You can learn more about reducing roofing costs and the options available in our eBook Need a New Roof? How Building Owners Reduce Cost with a Metal Roof by following the link below.